Bella’s yogic path has led her from a tea estate in Sri Lanka where she was born and where she spent her early years surrounded by eastern philosophies and spiritual practices, to the present day as an adopted ‘Brightonian’, coming to this vibrant city to visit friends in between her travels, and never leaving. She experienced her first yoga class in 2000 and she’s not looked back since, subsequently spending the last 17 years dedicating herself to developing her spiritual practice both on and off the mat. 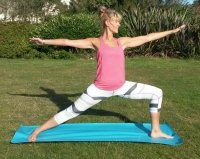 She is registered with Yoga Alliance UK having completed her training with Allie Hill and teaches full-time in Brighton and the Sussex area where she is a popular instructor within the local community. She has taught at the Brighton Yoga Festival for the last 2 years as well as regularly donating her teaching skills to charities and local events. Bella teaches hatha and vinyasa flow, as well as more meditative yin and restorative practices. Her classes are creative and playful with an emphasis on strengthening the body, calming the mind and staying centred because as she says: “nothing is more precious than being in this present moment, fully alive, fully aware”. Her teaching is compassionate and honest, always inviting students to be curious in their practice, weaving inspirational quotes and yogic texts into her classes, yet always relating to the bigger picture by encouraging students to be in harmony with themselves not just on their mats but also in their lives. Added to this is her contagious energy and deep passion for sharing the benefits of yoga with all ability levels, no matter what age, size or experience so students leave her classes feeling inspired and alive! India is the home of yoga and what better place to experience this spiritual practice than in the tropical warmth of Kerala in early April. It seems natural that we associate feeling warm with a sense of well-being and relaxation, and when the body is warm, the muscles and connective tissue become more elastic allowing you to go deeper into a yoga pose as the body opens and becomes more flexible. This retreat is open to all levels as modifications and variations will be given throughout so beginners as well as those with a more skilled practice will be safely challenged. Each class will be an eclectic hatha experience, with a focus on the fundamentals of a structurally sound yoga practice. Precise alignment in standing, seated and reclined poses are woven together by a slow flow, and each session focuses on a unique foundational movement pattern and is sequenced to steadily build those movement patterns into more challenging asana. The morning classes will start with centering and pranayama (breath work) to cleanse, ground and energise us, before moving into a deeper, invigorating combination of hatha and vinyasa flow yoga. With a sense of playfulness and exploration, each student on their individual level will work on improving flexibility, strength, stamina and balance, delving deeper into postures empowered by their breath. The late afternoon sessions will be a yin-yang practice, a more explorative and workshop-style class, bringing into balance the passive and active aspects of yoga with energising yet restorative asana, holding postures longer to allow a deeper release both in the mind and body. Bella makes an ideal host for our retreat to Kerala having travelled extensively in India, and through her upbringing feels naturally at home on the subcontinent. A great listener, with an infectious laugh, and zest for life, she intends her retreats to be fun and uplifting, a chance to make new friends and discover the amazing culture of India, and above all, a transformative yoga journey into the self, by the self, for the self. I just wanted to let you know what a wonderful Yoga holiday I had with Bella in Ischia. Her yoga as always was inventive, stimulating and sensitive to all the Yogi's on the holiday. Her passion to make the holiday (we call it a holiday rather than a retreat!) a wonderful experience for all of us, was embraced by open arms by the Yogi's. The group bonded extremely well and we spent most of the time in each other's company. The hotel with Michele as our main point of contact was perfect for this week - he looked after us very well. The food (delicious), accommodation (simple but clean) and surrounds ...breath taking ... were a delight Thank you!